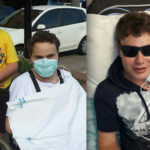 In 2005 at 13 months of age, Jarryd received his Gift of Life, a liver transplant, at the Red Cross Children’s hospital. He was just a couple of weeks away from death. This was our reality, when our miracle happened. Now, at 14 years’ old, he is a typical, happy, energetic teenager, living life to the full with a sense of humour that just never stops. Biliary Atresia is a rare liver disease and there is no cure. A liver transplant is the only hope for someone with Biliary Atresia because bile cannot flow through the bile ducts, which is what makes this disease so life threatening. Symptoms include pale stools, jaundice, and a swollen abdomen, to name just a few. Prior to Jarryd’s diagnosis we as a family had never heard of Biliary Atresia. At 8 months old, Jarryd was listed as critical on the transplant waiting list. After spending most of his life in hospital, for various procedures, (2 Kasai operations, biopsies, hernia ops, pneumonia, ascites, infections and many more) … he was deemed as critical after a very serious hospital visit, where he vomited blood. His little tummy was so swollen; he was so uncomfortable and seriously underweight. 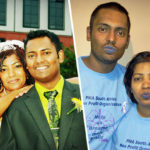 In 2005, we had to fly to Cape Town from Durban after Jarryd had been in hospital for 2 full weeks’ and was very ill. This was supposed to be our final flight to CPT, to make Jarryd as comfortable as we could, for what we had been told was his last few weeks, as he was in terrible pain all the time. Once we landed, I switched my phone on whilst we were collecting our luggage, and it rang immediately. It was Dr McCullough from Red Cross Children’s Hospital, asking if we were in Cape Town yet, and giving me the news that our journey was about to change, from a journey to make our child comfortable through his last couple of weeks’, to a true miracle. We had a donor!! 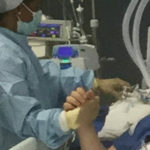 Jarryd’s transplant operation began at 5pm that evening. Gosh, I cannot explain that night. We sat in a room in the Nurses’ home, speaking to the Doctors’ in theatre regularly and praying. Our family and friends called us throughout the night, we tried sleeping, and tried being ‘normal’ but the reality was that we had no idea if Jarryd would pull through. At 3.20 the next morning we got the call saying he was out of theatre and in ICU. Before seeing Jarryd, we were given the stark reality of Jarryd’s health, pre-transplant. His Surgeon told us exactly how bad Jarryd was, how seriously ill he had been. We then scrubbed down (these kiddies are immune suppressed after transplant, so hygiene and diet is by far one of the most important things for them) and it was a SHOCK to see him. He had tubes and pipes coming from everywhere and a massive scar. His head was bandaged up, he was tied to the bed (so he didn’t pull the many drips out), he had a drip in his neck, left arm, both feet, he was on a ventilator, had a catheter, a permanent thermometer, two drains coming out of his stomach and a massive cut (like an upside-down T), covered in see through plaster across his stomach. 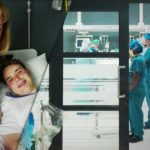 During Jarryd’s 10 days in ICU, the moment Jarryd opened his eyes for the first time, was by far one of the most precious moment. The beautiful white of his eyes was sparkling; we had never seen his eyes white before. While his journey would still be a long 3 months in hospital we still had our son. 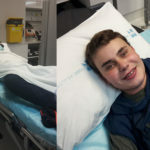 Jarryd got septicaemia through a porto-cath inserted in his chest during this time and that was a long, long night waiting to see if this would turn, or if we were going to lose him. He developed an addiction to morphine which was very scary especially as we had to watch as he was weaned off it. Jarryd had to learn to do many things again; from learning to eat – where he was introduced to milk, then pureed food; to teaching him to walk. His walking was hampered by his tummy as it was much bigger than that of any other 13 month old so his tiny little legs really struggled with holding him up. He even developed a heart murmur. It was really hard being apart, with me staying in hospital, in Cape Town with Jarryd and Wayne returning to Pietermaritzburg where we lived. My body even started craving veggies because of my bad diet, but this little guy just turned it around, with his bright smile, his first steps he took in hospital, his laugh, gosh he laughed a lot and smiled so much. 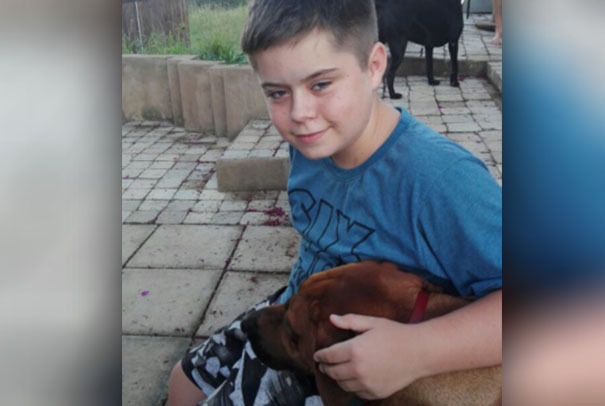 There was a young teen who had received a kidney transplant recovering in the room next door, who Jarryd became attached to. The two of them would spend time together in Jarryd’s room and it became ritual each day. She was a beautiful young girl who was such an inspiration. 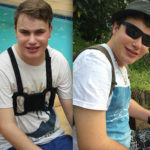 Jarryd’s personality is fantastic; he has a wonderful sense of humour and loves doing normal teenage stuff. He understands his journey, knows his story, is proud of the scars he has, and is as grateful as we are. Wayne and I have often sat, just thinking about what Jarryd has brought to our lives. What we would have missed had we not had this opportunity to raise this wonderful young man. If there was anything we could say to our Donor Family, it is THANK YOU, from the bottom of our hearts, Thank You! We know our day of celebration is yours of mourning and we will be eternally grateful for what you have done for us. You are in our thoughts and prayers and will always be. Your bravery through hardship has changed our lives; there are not enough words to express how we feel. 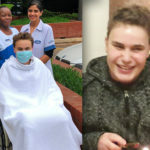 Please help us to give other awaiting transplant patients hope and raise awareness about organ and tissue donation by SHARING Jarryd’s story. Talk about, register as, and share your decision to be an organ and tissue donor today.